100% Cotton Six-Strand Floss. 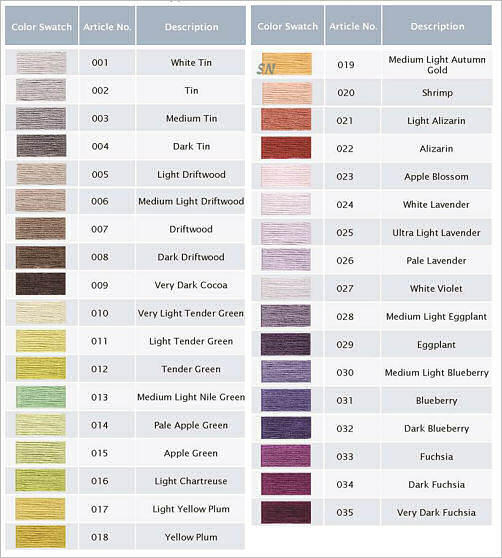 Colorfast, and offered in 8 meter (8.7 yard) skeins. The color names listed beside each number are *suggested* names developed over time to describe the color line. DMC does NOT officially use these names... only their numbers to describe their thread. Various designers often use other names to describe the DMC colors on their patterns. While color *names* will vary... DMC color *numbers* have not changed in the company's 250 year history. 35 NEW DMC Flosses... They're Here!!!. The 35 new colors are being released in a metal tin. Once you take your threads out of it, it'll make a neat little traveling tin for scissors, threaders and needles! Inspired by contemporary color trends, supposedly these are going to match lots of our available linens... not much info on that as of now. These WILL be available OPEN STOCK... this means you can purchase any of these singly if need be. (We will add them to the clicky boxes on the DMC page as soon as they have arrived.) The last batch of 'new flosses' came a few years ago in a boxed set and those are STILL not available singly. So... this is a lovely surprise! Color numbers will begin at 001 and go through 035. We have them all, and are starting to ship!